It’s no secret that Honeycrisp is a fantastic apple. What may surprise consumers is that this variety is almost as notorious, amongst apple growers, as a difficult finicky apple to grow. One of its shortcomings is unusual susceptibility to tree trunk rot. As one of the first orchards to jump on the Honeycrisp bandwagon, Fairhaven Farm was also one of the first orchards to suffer extensive tree loss in its original plantings. This has led to new Honeycrisp plantings using some of the newest tree training systems and concepts. 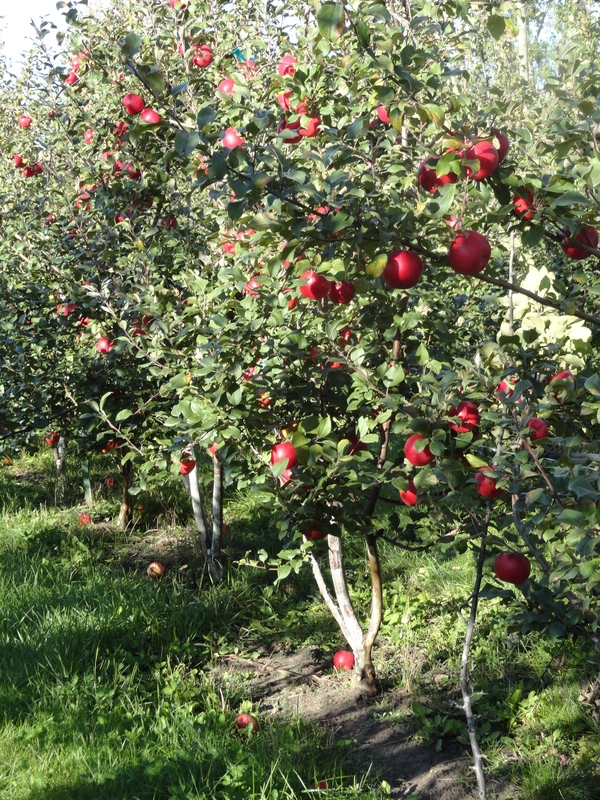 Shown here is the first crop of Honeycrisp on triple trunked trees trained to the Tall Spindle training system. A walk through the orchard at Fairhaven Farm reveals an intriguing array of different compact new plantings as we seek to find the ideal way to grow apples on our particular site. Cool but sunny weekend should be perfect for a trip the the orchard. This weekend you can pick your own Haralson apples and the perfect pumpkin. The horses will be ready to take on a wagon ride both afternoons and the maze is always good for a wander.